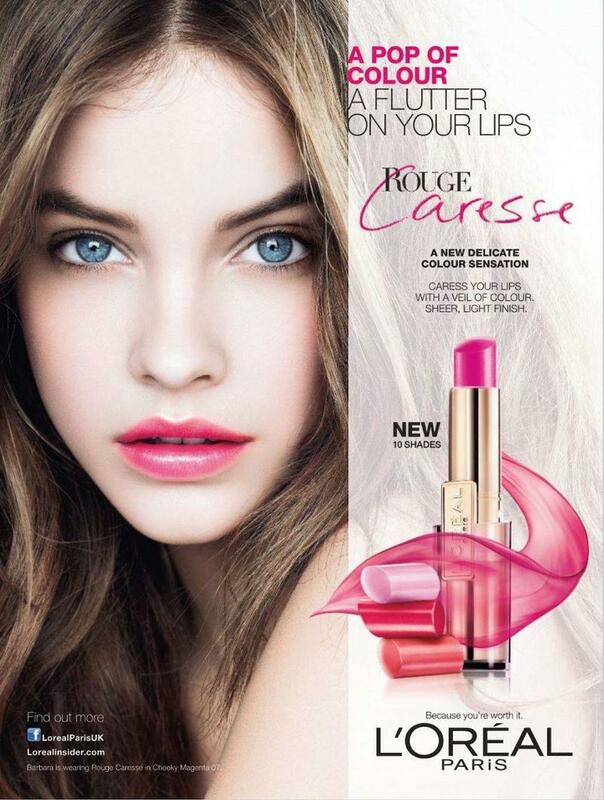 This print ad by L’oreal Paris is advertising a new lipstick called ‘Rogue Caresse’. It is targeted at teenagers and young adults. This was probably published in magazines, posters and bus shelters. The ad is persuading us by using weasel words, colour, star power and scale. L’oreal Paris has used star power by featuring a famous model, Barbara Palvin. She is a role model for teenagers and young adults and by her using this product, it makes it seem more appealing. Barbara is a very beautiful model and many young girls would probably buy this product to be like her/look like her. This also leads onto bandwagon. The ad is saying that you should join Barbara in wearing this lipstick. The colour scheme mainly consists pink. Pink is an appealing colour when it comes to make-up because is it is very girly and feminine. It attracts the attention of the audience because it is a bright, bold colour. Some of the text is in pink and that makes people want to read it. In the ad, it uses weasel words by stating, ‘a new delicate colour sensation’ and, ‘caress your lips with a veil of colour. Sheer, light finish.’ It allurers the audience by giving them some facts and by describing how amazing this product is. The lipstick size compared to the size of Barbara is also another advertising technique. The lipstick is almost the size of her face so the scale of the product is enhanced. It is symbolising that this product is large and will last you a long time, so it is worth the cost. In conclusion, I think that the advertisement did a very good job of attracting the audiences attention. It correctly uses weasel words, colour, star power and scale meaning that the ad was a success.